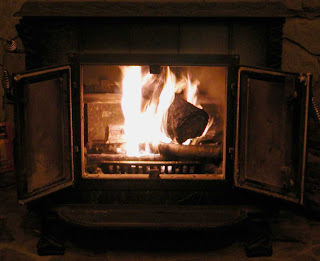 Tonight, the cool weather arrived, and with it, the 2007 inaugural autumn lighting of the woodburning fireplace in the Great Room. What a nice way to relax after a day of searching for beautiful fall foliage on an otherwise rainy and dreary day. We spent the evening warming up in front of the fire engaged in a nice conversation with two of our guests, Ashley and Mary (who are visiting the Inn for the second time). We wonder if our friends, Mark and Eileen in Bay Village, have been getting good use out of their fireplace this season…how’s the Ohio weather? Eileen’s been the fire-tender so far. We’re in the pleasant one burn a day stage. We got some cherry wood in this year and are looking forward to trying it out on a leisurely evening.